At least a thousand ‘Take Back the City’ protesters gathered at Dublin's Garden of Remembrance today to express their demands before marching on O’Connell Street and closing off O'Connell Bridge in an attempt 'to shut down the whole city'. Speeches called for an end to evictions, increased provision of social housing and affordable rents. Protesters Teresa Phelan and Anna Smith, who were present to show their support for the movement, spoke about their personal experiences that brought them out onto the street. “I’ve been homeless myself, I have a daughter who was homeless. People are under the misconception that it’s only students that are taking to the streets for this. It's not, look around, it's families, it's grandmothers,” said Ms Phelan, who is from Finglas in Dublin. “There are people all over Dublin living in deplorable conditions. I have a family member and there are eight of them living in a two bedroom squalid house owned by Dublin City Council. Him and his partner have been sleeping on a mattress for the last five years. They’re forgotten people,” she said. “My sister is homeless as well,” Ms Smith said. “My other sister is in a BnB in Clondalkin with a baby. “Nobody cares, nobody even stops to ask why these people are there,” she said. “You walk through Dublin City, and nearly every second or third doorway is full of homeless people. They’re not all on drugs and they’re not all alcoholics. But even so, the ones that are, do they not deserve our help? A hand up? Do they not deserve somewhere to go? “Everyone makes mistakes, but do they not deserve somewhere to go where they can reflect and say - what have I done with my life?” Ms Cash said. “Eoghan Murphy needs to resign!! !” she called to a crowd of cheers, referring to the Housing Minister. “Stand up against Fine Gael and Fianna Fail privatisation policies. They’re gentrifying the city and forcing people out of their communities. It’s about time that people stand up and prove that housing is a human right for everybody,” they said. 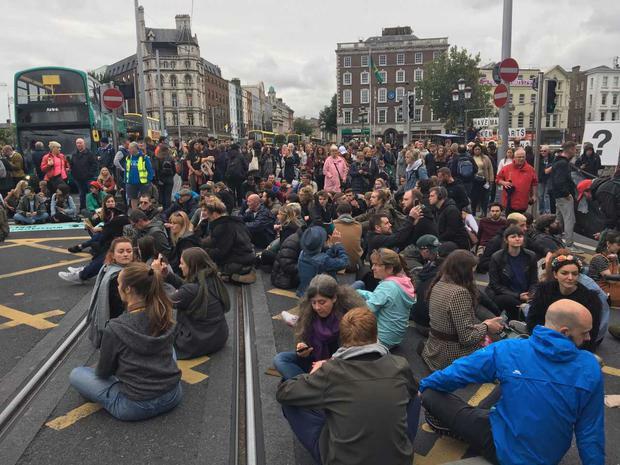 Following the gathering at the Garden of Remembrance, the protesters marched down O'Connell Street to O'Connell Bridge where they staged a sit-down protest. The protest blocked traffic on routes onto the bridge for a time this afternoon but the crowd has now dispersed and traffic is returning to normal in the area. 'Take Back The City', who have hit headlines for occupying vacant properties in Dublin's north inner city, said it's "time for the movement to grow". Campaigners have been calling for vacant properties to be subject to Compulsory Purchase Orders to end evictions. As part of their "nationwide action", rallies and protests were also organised in Cork, Waterford, Sligo, Wexford, Kildare, Limerick, Sligo, Derry, Belfast, Drogheda, Maynooth and Bray.